On Friday, September 16th, 2016 Macys held its second annual Fashion’s Front Row event in their San Francisco Union Square store. Attendees sat on a runway set up among women’s fashion on the third floor which allowed for shoppers to steal some of the looks sashayed down the runway immediately after the show. The show was hosted by reality TV star Kelly. The show opened with 70’s inspired day looks featuring faux-suede color blocked dresses, strap heels, and knee-high boots. For the men, models showed off unique suit jackets made with jewel tones, shimmery threads, and floral patterns paired with jeans and shiny black dress shoes. Hello Kitty brought out the mini models to showcase some back-to-school looks for preschoolers and elementary school students. The show also featured some casual looks of black skinny jeans paired with concert tees, structured leather jackets, and boots. 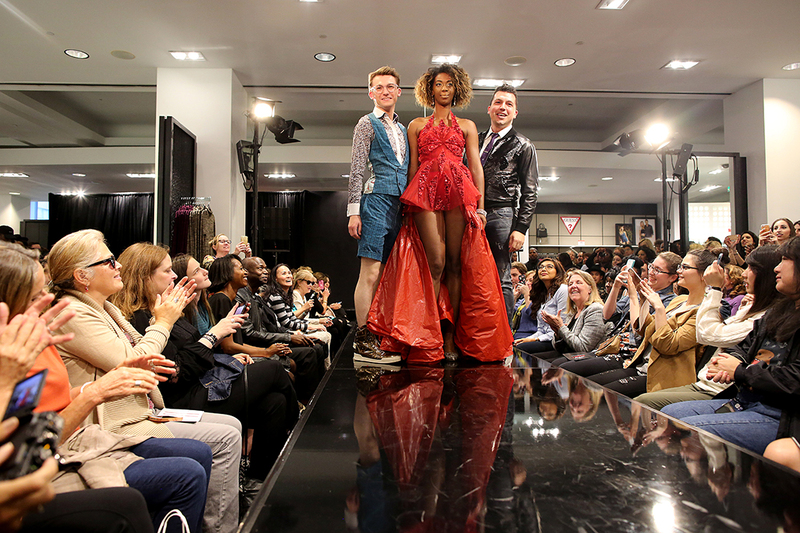 Some of the best looks of the evening came from Project Runway stars Jake Wall and Blake Patterson who repurposed trashed materials into stunning creations, one a short, corset-style crimson dress flanked on each hip by ankle-length, shredded pieces of a red trash bag. The after party included tastes from local vendors like Nopalito’s organic Mexican dishes and Bicycle Báhn Mí’s Vietnamese/Californian fusion. Participants also had the opportunity to take a picture with Osbourne and Hello Kitty, get some makeup tips from ? and advice from Osbourne’s stylists, all set to DJ ?’s pop mash-ups. Macys, the largest retail brand of Macys, Inc., delivers fashion and affordable luxury to customers at more than 800 locations in 45 states, the District of Columbia, Puerto Rico and Guam. Macys stores and macys.com offer distinctive assortments including the most desired family of exclusive and fashion brands for him, her and home. Macys is known for such epic events as Macys 4th of July Fireworks® and the Macys Thanksgiving Day Parade®, as well as spectacular fashion shows, culinary events, flower shows and celebrity appearances. Building on a 150-year tradition, Macys helps strengthen communities by supporting local and national charities that make a difference in the lives of our customers.